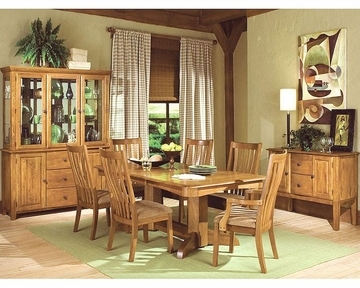 The Highland Park Dining Set From Intercon Is Made From Solid Oak And Finished In Classic Rustic Oak. 1 x Dining Trestle Table Base IN-HP-TA-4296-RUS-BSE. 1 x Dining Trestle Table Top IN-HP-TA-4296-RUS-TOP. 2 x Slat Back Arm Chair IN-HP-CH-N460A-RUS-RTA. 4 x Slat Back Side Chair IN-HP-CH-N460-RUS-RTA. Arm Chair - 23"W x 18"D x 42"H.
Two self-storing leaves and ball bearing slides for easy opening.